As a child, growing up in the suburbs as I did meant that a trip into the city of Atlanta was something that was always exciting and eagerly anticipated. Back then, in just under an hour you could really see the transition from the small, rural environment to the big city in a much more dramatic way as the Atlanta sprawl was still pretty much contained to inside the perimeter. There were certain things that were fascinating to me about the city, things I always wanted to see when we went there such as Fulton County Stadium where Dad would take me to baseball games and the downtown Rich’s where Mom would go shopping and where we would go to see the Rich’s Great Tree. The giant neon CocaCola sign, the Fox Theater, the Varsity and the Krispy Kreme on Ponce de Leon were all favorites as well but to my mind, the most exciting thing to see in Atlanta was the Polaris. From my earliest memories of going to downtown, the Polaris was a part of the Atlanta experience, much like the aforementioned landmarks, some of which are now gone. I associated all of these with the excitement of leaving a small town for the day and traveling to a city of soaring skyscrapers, fascinating sights, interesting places and fun things to do. Each of them held a special place in my memory but none of them fascinated me as much as the magical flying saucer that dominated the Atlanta skyline of my childhood. It was practically brand new when I first became aware of it, floating high above the Hyatt Regency hotel. You couldn’t help but notice it coming in from the south on I-75, which even then was congested as Atlanta growth began to explode and push outward from its core. It’s hard to imagine that at one time, the Polaris had pretty much an unobstructed view of the entire city but that was a fact when I was still small, which also meant that you could see it from pretty much anywhere in the city. To my three year old imagination, I just knew it was going to take off and fly somewhere and I wanted to be on it when it did. My parents used to tell me that I would insist on them driving by it anytime we went into the city and they usually would accommodate my request. As striking as it was in the daytime, it was the nighttime that really transformed it into something remarkable to see, lit from below with floodlights and with its brightly glowing blue dome sitting atop a 360° panoramic, revolving lounge. I never could understand why my parents wouldn’t take me up there to actually see it back then but I guess it was because children either weren’t allowed in a bar/lounge or if they were, my parents didn’t think it was appropriate. They would go there sometimes for dinner on special occasions like anniversaries or just a night on the town and I remember that Mom brought me back a souvenir once…a red plastic stick used to decorate a drink, complete with the Polaris on top of it! Despite never getting to actually experience the Polaris, I never lost my fascination for what became one of Atlanta’s iconic landmarks and a part of the history of the city. For years, the Polaris turned while Atlanta grew up around it. Skyscrapers, much taller, sprouted in the downtown area and soon eclipsed the views it once afforded but even as I grew older, I always looked for it when passing through downtown on the interstate, knowing just where the gaps were that allowed one to see it. 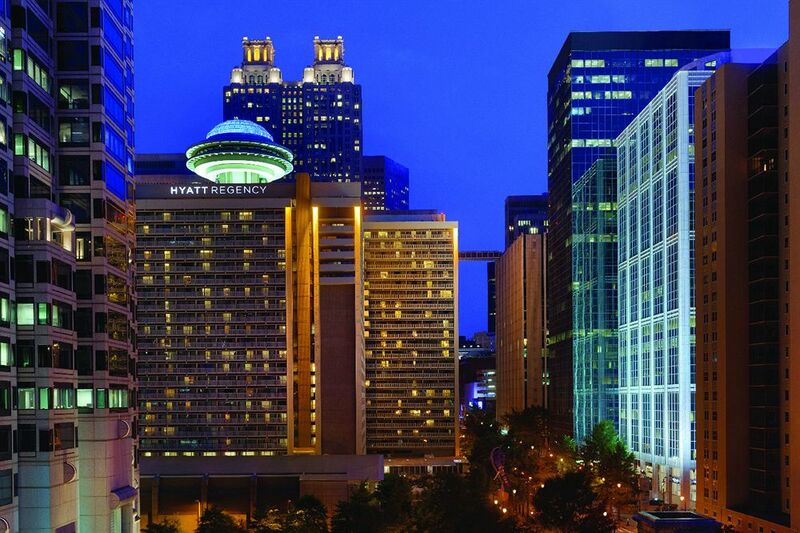 As architecture became a favorite subject of study for me, the name of John Portman and his works became familiar and the Polaris, as well as the Hyatt Regency was certainly one of his finest efforts to design something different, that set it apart from the more mundane towers that were the norm back then. As time went by and with each new building, the Polaris lost a bit more ground in the height department but nothing could compete with its bold, daring architectural design. In the style department, it was and still is in a class by itself. A few years ago, I attended a conference held at the Hyatt and was excited about finally getting to stay at the home of the Polaris. The hotel had recently been overhauled, yet it evoked a sense of midcentury modern style that Don Draper and the cast of “Mad Men” would have been very much at home in, a design period that is a favorite of mine. Sadly, as I was to learn, the Polaris had been closed for a few years by then and was completely inaccessible. Believe me, I tried in vain to persuade (or con) someone into taking me up there and letting me see it and I was angry at myself that I had let opportunities to visit the Polaris while it was still open pass by. I had to be content that at least it was still there, unlike the Atlanta Stadium, the CocaCola sign and Rich’s. I couldn’t go up and see it in person but from my balcony in the hotel, I could see it reflected in the glass of the adjacent building and marveled at how big it really was this close up. I never gave up the hope that someday I would get to actually experience the Polaris from the inside and after nearly 48 years of waiting, I may get my chance in the upcoming new year of 2014. 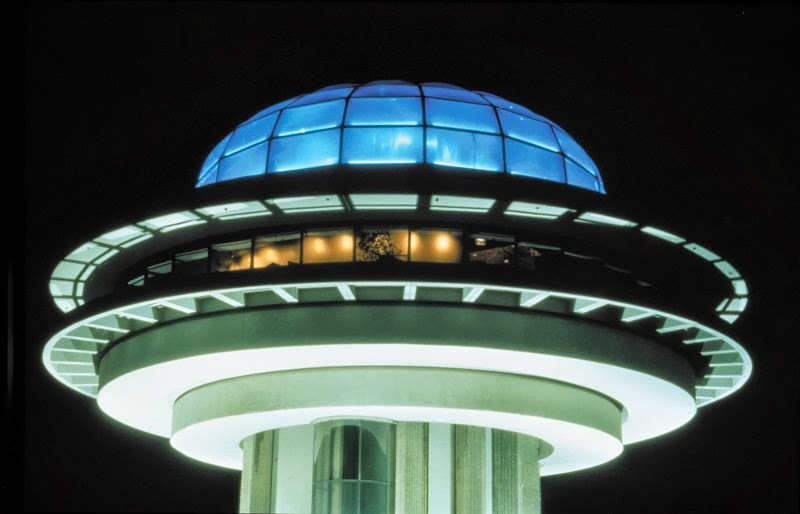 Renovated, revised and better than ever, the magical flying saucer of Atlanta will soon spin once again, taking guests on a ride in its iconic glass elevators to the space age 1960’s glory of the Jetsons, reimagined for the 21st century. Visiting the Polaris won’t be the highest building I’ve ever been in but it will surely be a high point for me to finally get to see it. I won’t put it off this time! In an age where landmarks are easily disposed of and replaced, and in a city where institutions and icons have come and gone, it’s nice to see that some things which have been so much a part of Atlanta will continue to be a part of it all, mixing the past with the present and the future to form an identity that is uniquely our own. Just as the Fox continues to entertain and the Varsity continues to feed the hungry masses, the Polaris will continue to soar over downtown and hopefully fire the imaginations of a new generation.